The social media party is just warming up as business continues its ongoing transformation. An hour with Google can reveal the potential of embarking on a fruitful social media strategy benefitting businesses and their bottom lines, so why then is first mover advantage still there to be had in most business categories? Management guru Edward Deming once said, “In God we trust. All others must bring data”. The hero topic in most social discussions is ROI, but I believe the focus should be on COI (cost of inaction). The cost of deliberating, for whatever reason, is always going to be higher than simply opening up collective minds to the undeniable opportunity that is social media. Brands face an incredibly complex challenge as they have to play with many dials at the same time: traditional ads, digital, web, mobile, apps, social, behavioural. All are tightly intertwined, creating flurries of new metrics: ROI, naturally, but also engagement, sentiment and feelings. So what possible barriers to entry could there be? What’s stopping businesses from capitalising on the biggest opportunity in decades to leverage a long term competitive advantage over their competitors? 35% want case studies and examples. very few know how to begin the process of getting it right. When it comes to social media the first thing to avoid is the HIPPO (highest paid person’s opinion) syndrome. In many organisations, the highest paid person in your organisation very often has no clue about social media marketing or believes the IT person actually does this! So when this person dictates strategies and tactics, you’re going to run into trouble. We’ve witnessed time and time again that the most senior people in business ‘don’t know what they don’t know’ when it comes to most things social. Fair enough, sort of, but at least have the moxie to admit it, or invest some time to upgrade your knowledge. 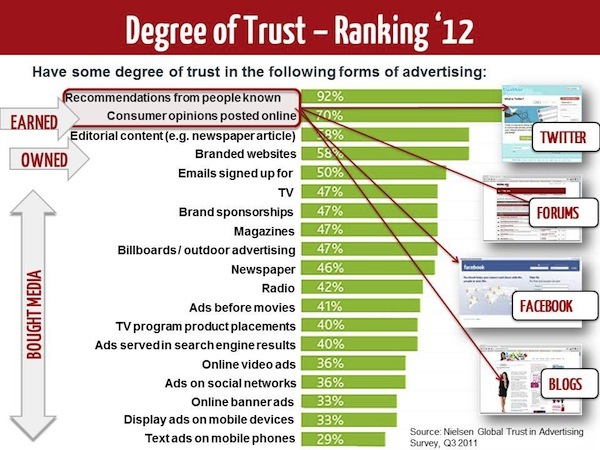 There’s been plenty of comment about this survey and I just want to focus on the top two most trusted sources: recommendations and opinions. I’d imagine that the degree of customers’ engagement and the commensurate cost are top of mind for brands. Brands can have a credible presence here providing they don’t use the new tools in the old ‘push’ way, and providing they understand how they can add value to their customer base, not just talk about themselves. The problem for traditional media is that they don’t own these two segments – social networks and consumer websites do. The likes of TV and print (newspapers and mags) which attract an annual investment of approximately $3.5 billion and $3.8 billion respectively, in Australia, are based on a less than ideal engagement metric. For example the all-important TARP metric is based upon the TV being on whilst someone is in the room and a reader is based upon having seen or looked at the front cover. identifying real-time insights for your brand and competitors. Size of budget has always been a key discriminator, until now. Now it’s about building relationships, something that takes time and cannot be countered with a competitor’s short term investment no matter how sizeable. Although the marketing department is usually the front door for social media, once it enters a business it should become all pervasive, across all departments (sales, customer service, IT, HR, PR, research, search, promotions, creative etc.) Rather than being 100% of someone’s role, it’s more likely to become 5% of 20 people’s roles. 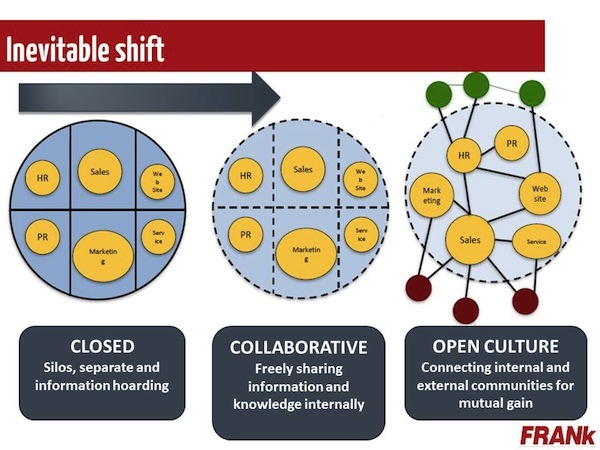 Subsequently well-established silos within business will become eroded in the quest for an open and collaborative culture both internally and externally with partners and suppliers. Clearly this will take time, particularly in larger businesses. Such a shift will be regarded as threatening by people who run these silos, generally middle management. The thing is that the shift is inevitable and it’s better to champion the new culture rather than ignore the inevitable. This ring true for anyone? Well it’s not with the tools. If you’re beginning wondering how to use Twitter, Pinterest and Facebook then you’re starting in the wrong place. It’s highly preferable to begin with your business’s relationship footprint, internally and externally. You have to understand your business needs, social capacity, establish your ROI metrics, audience analysis, staff guidelines, training and support and stakeholder participation. This is 101 stuff but seems to be basically ignored. Following the six fundamentals of growing a successful social business is easy – you just need to make the jump. Continue to disregard social media at your peril. Now is a great time to gain ground on your competitive pack through better understanding your customers. Aim higher than cursory ‘likes’ or ‘followers’ and turn COI into ROI. 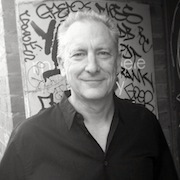 Martyn Thomas is the managing director of Melbourne based FRANk Media, a hybrid full service agency with social business strategy at the core. Martyns’ ethos is to consistently add value for clients and keep marketing teams abreast of the world outside their office.